A new regeneration cycle, a new Doctor and a farewell. Matt Smith’s time as The Doctor has finally come to an end in a story that takes place yet again on Trenzalore. The Doctor’s greatest battle to defend the people of Christmas from all his greatest enemies are all in orbiting the planet waiting to see if he says his name to allow the Time Lords to return. 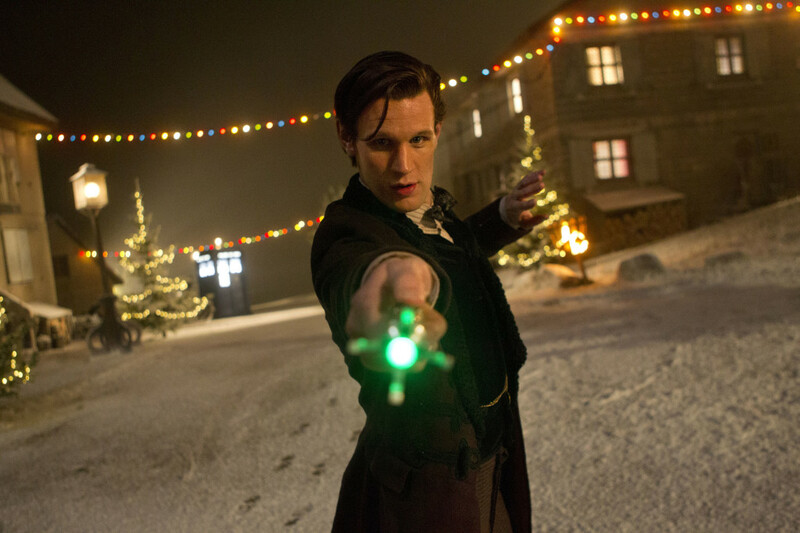 The Time of The Doctor is 2013’s Christmas Special and it is a bittersweet affair as we say goodbye to Matt Smith as he regenerates, and we say hello to Peter Capaldi. The Time of The Doctor is a mixed bag. On the whole I did enjoy it but there was a couple of things that got me scratching my head wondering why Steven Moffat felt he needed to add these situations into the story: For one, why did they find it necessary to have The Doctor walking around naked? Even when The Doctor used the holographic clothes and then went to meet Clara’s parents for Christmas dinner he was clearly naked and it just made for a really stupid moment. It just seemed so juvenile and doesn’t need to be in a science fiction show. I know the show needs to be light-hearted at times but that was just too immature. What’s next fart jokes? Umm well that’s been done already also so moving on. I’m also tired of every woman who The Doctor befriends or knows wants to sleep with him. This is getting old and is a tired gimmick that has run its course. Hopefully in the Peter Capaldi era we don’t see this anymore and we can get back to storytelling and leave the soap opera stuff to Eastenders and Coronation Street. It was funny how they incorporated Matt Smith having to shave his head for a movie he filmed. However, saying he shaved his head and had to wear a wig because he was bored. They could have left that bit out, but it was quite a surprise when he took the wig off. In true Doctor form he sacrifices his life to defend the innocent. The people of Christmas are the benefactor of The Doctor protecting them and he ends up protecting them until he is an old man living out his final moments. In fact, this deed will end up killing him as he cannot regenerate anymore. I like how this was resolved as the Time Lords bestowed upon him another regeneration cycle. It was simple and that is exactly how it should have been. Something uncomplicated as just giving The Doctor a new life cycle with no drama and reviving an old man at the end of his life. We know the Time Lords can do that as they offered The Master the same thing as a reward in ‘The Five Doctors’. It was just a perfect way to do it and the show will go on without a hitch. I did like the story for the most part when the silliness was ended. I really enjoyed watching The Doctor who stayed for Christmas as it was a story and something you would expect The Doctor to do. It was interesting to see how he changed through the time that Clara came back to see him and what he did in the meantime by fixing the children’s toys and telling them stories of his adventures. It was also sad to watch as this was a man who is used to exploring and he is stuck in one place defending everyone as he is doing it. You can’t help but feel sorry for him and we see him get old in front of us. This part of the story I really enjoyed and it felt cheapened by the stupidity of the opening minutes. I liked how everything was resolved from his era. What he saw in the hotel room from ‘The God Complex’, who blew up his TARDIS and the meaning of the crack. For the diehard fan of the show this was good and put an ending to storylines. But the casual viewer might be confused and lost. Oh well, if they were expecting a lighthearted Christmas tale then the jokes on them. It’s Matt Smith’s regeneration story they should have known his farewell. Stories that are never lighthearted to begin with. Plus, the resolution to the storylines was quick and they didn’t take precedence over the overall story, so there shouldn’t have been much confusion from the casual fan. I did like how The Doctor used his regeneration energy to destroy the Daleks. If it can destroy the inside of the TARDIS I guess it can destroy the Daleks. This takes us to Matt Smith’s farewell scene the whole reason for this year’s Christmas special. This is one of the best and emotional swan songs in many years of regeneration stories. Steven Moffat is really good at writing emotional speeches and this is one of his best. It was sad watching him talking to Clara with the Long Song from ‘The Rings of Akhaten’ playing and then Amy Pond’s appearance makes the moment even more emotional. It really hit home when he took off the bow tie and looked at it before dropping it to the TARDIS floor. Symbolising that his life is over and that the ‘bow ties are cool’ man is now forever gone. It was such a powerful scene, handled well and quite fitting for Matt Smith. Even more shocking and emotional was how fast he became the next Doctor as we get a quick glimpse of Peter Capaldi to the shock of Clara whose facial expressions are priceless with Jenna Coleman doing an excellent job in this scene.